Amity catcher Racheal Crow tags out New Haven pinch-runner Juliana Jones out at the plate for the final out of the 9th inning during a softball game on Wednesday. NORTH HAVEN — Alexa Ferriouolo took a deep breath and stepped into the batter’s box. It was the bottom of the 11th inning and closing in on two and a half hours of softball. But the North Haven sophomore shortstop sent everyone home Wednesday afternoon as she lined a single to center field to score Sara Lombardi with the winning run as the Indians (12th-ranked in the GametimeCT.com/New Haven Register poll) remained unbeaten in three games with a 2-1 victory over 4th-ranked Amity in a big early season Southern Connecticut Conference battle. It was a rematch of the SCC championship game from last spring in which the North Haven beat Amity, 12-8. 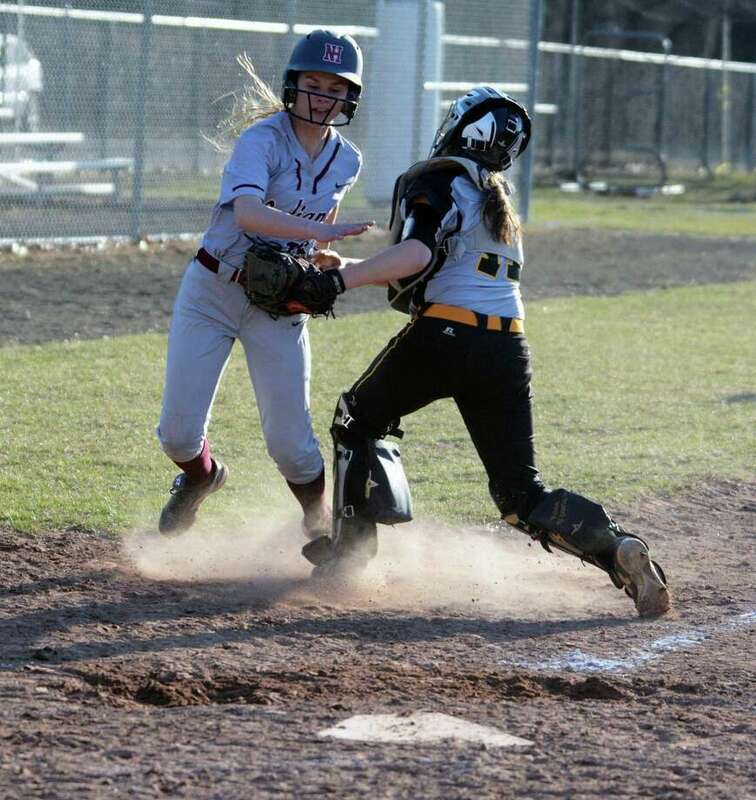 However, it was a much stingier game run-wise this time as Amity pitchers Abbey Fletcher and Kelly Pritchard dueled with North Haven’s Lauren Card (nine strikeouts). Both starting pitchers were perfect for the first three innings, but North Haven finally got on the board in the bottom of the fourth inning. With one out, Olivia Peterson bunted, but Fletcher threw the ball into the runner at first base and the ball went astray down the first base line as Peterson took second. After Lombardi sacrificed her to third, Gigi Russo to right to plate Peterson to make it 1-0. But it didn’t take long for Amity to strike back. With two outs in the top of the fifth, Rachael Crow walked and Elizabeth Brownfield was hit by a pitch. Leia Foyer followed with a single to right to bring in tying run before she was nailed at second base trying to stretch it into a double. For a while after that, zeroes just kept on being posted on the scoreboard. Each team did have opportunities to score. Amity had two hits and a walk in the seventh, but Kelly Pritchard was gunned down at second after she took too big of a turn at second base and was caught in no man’s land. North Haven had two huge chances in the eighth and ninth innings, respectively. Card reached on an error and Peyton Davis doubled to right with one out in the eighth, but Pritchard came on in relief of Fletcher to get Amity out of the inning. “Abbey did a great job, but we thought it was a great time to put in someone different to give them a different look,” Amity coach Sara Hale said. In the ninth, Russo singled and Eryn Sheeley walked with none out to give North Haven a big chance to end the game. After Ferriouolo sacrificed them each up a base, Hayley Garthwait flew out to left field, but courtesy runner Juliana Jones was thrown out at the plate by 10 feet with a perfect throw by Juliette Zito. Amity fell to 1-1 with the loss. Records: Amity, 1-1; North Haven, 3-0. Batteries: Amity — Abbey Fletcher, Kelly Pritchard (8) and Rachael Crow. NH — Lauren Card and Gigi Russo. 2B: NH — Peyton Davis. RBI: NH — Gigi Russo and Alexa Ferriouolo. A — Leia Foyer. Winning pitcher: Card. (W, 3-0). Losing pitcher: Pritchard (L, 1-1).